Haven of peace in a sublime region Chalet 'Les Moulins', all wood of the region, is located in the Regional Park of Morvan at the edge of Lake Pannecière. 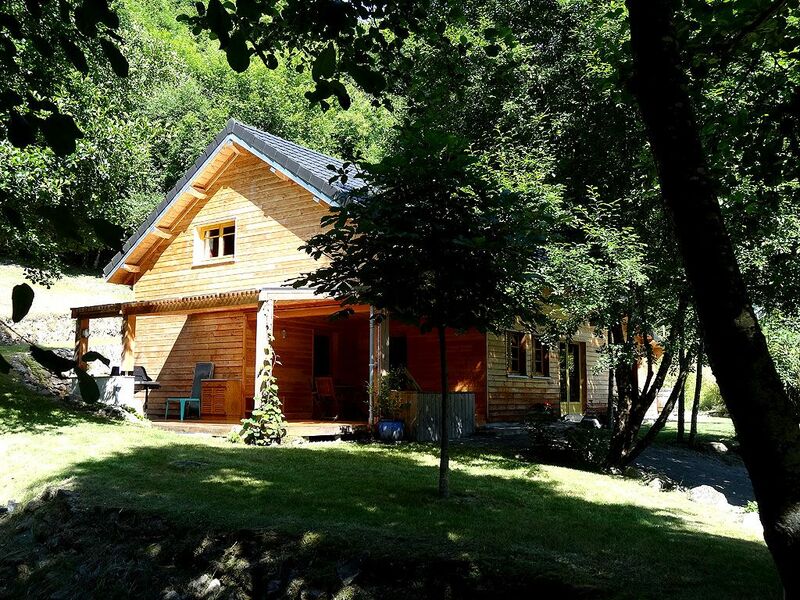 Warm and elegant, this chalet on 2 levels is heated by a wood stove. The staircase is in century oak. The combination of these materials has created a cozy, practical and functional atmosphere. On the ground floor, a large main room on one side of the living room, on the other the kitchen open to the dining room with direct access to the terrace of 38 m² overlooking Lake Pannecière. A room, a bathroom and a toilet suspended with lava hands. The living room is equipped with a flat screen TV, a sofa, three armchairs and two poufs. The dining room can accommodate 8 guests. The kitchen is equipped with a fridge, an induction hob, an oven, a microwave, a dishwasher, a washing machine, a classic coffee maker, Tassimo coffee maker, kettle, toaster, fondue set and raclette service. The room is equipped with a double bed 160 * 200, two bedside tables, a dresser and a flat screen TV. The bathroom is equipped with a bath, a walk-in shower, a vanity unit, a towel dryer and a hair dryer. The 38 m² terrace is equipped with a gas barbecue and a lunch area with teak furniture, overlooking Lake Pannecière. The floor is served by a mezzanine overlooking the kitchen and the dining room, a double room and a mezzanine bedroom. The bedroom is equipped with a double bed of 140 * 190, two wardrobe spaces and a chest of drawers. The mezzanine bedroom is equipped with two single beds of 80 * 200, a bedside table and a chest of drawers. The mezzanine comprises two single beds of 90 * 190 and two dressers, an office area, a large closet. Provision of games and books. On request a crib, a high chair and a changing table are available. The land is composed of several levels. The first has a parking 2 places and a reservoir closed and secure for our friends fishermen. The second is an orchard. Then another landing has a third parking space. Finally, on the last floor are the chalet. The back of the chalet offers a view of the forest. Ping-pong table made available in the summer. Lake Pannecière is the largest lake in Burgundy, a vast blue expanse of 520 hectares. It is in the heart of an exceptional green setting preserved in the Regional Natural Park of Morvan. It is above all a dam-reservoir built in the early twentieth century following the flood of Paris. It serves to regulate the waters of the river Yonne, so its appearance, and therefore its level, changes throughout the year. Fishing is the main activity of Lake Pannecière, indeed, it is the largest and most fish of lakes Morvan. You can also go hiking, 1500 km of marked hiking trails, horseback riding (an equestrian circuit along the lake), mountain biking, 2476 km of marked mountain bike trails. Scuba diving. The waters of Lake Pannecière are plunged day and night. The site allows especially to train. Good visibility from March to mid July, beautiful meadows, stone bridges at 6 and 9 m and ruins of the village at 12 m.
The chalet 'Les Moulins' is close to Château-Chinon where are shops, restaurants, the Septennat Museum, the Costume Museum. Had a lovely holiday here, beautiful spot. By the lake although there is a small road between the lake and chalet. Chalet is very well equipped, nice kitchen bathroom and sitting area. Also a really good barbecue outside. Some of the upstairs beds are open plan, although one separate two bed bedroom up there, also the main bedroom downstairs. Could use another wc depending how many people stay but we managed fine and the bathroom that is there is very well equipped. All in all we had a delightful stay in this beautiful part of France, would thoroughly recommend for those wanting to get away from it all. This place was perfect for getting away from it all. It was so quiet that often you only heard the sounds of nature. The garden is beautiful. The house is enormous and very well maintained. We were very comfortable there. Everything you need is available in the house. The lake was wonderful for swimming in and the surrounding area was very pretty. Aurelie always was very prompt with her communications and answered many questions we had. We had our little 1.5-year old with us who enjoyed the garden. Most of the house and garden is secure for a small toddler though there are some sharp corners on the furniture, steep drops in the garden and sharp stones. If your toddler is a bit older, you will probably have a slightly easier time letting them roam. We did have to keep an eye on him literally at all times but still the biggest dangers of the small ponds on the property and access to the main road were all secured with fences. So there was some peace of mind. There isn't much to do in the area which suited us just fine, we just wanted to relax. There are no real hiking paths which is a bit of a shame - always walking alongside the road but it's not busy. Also, I didn't find any good bakery anywhere in a 30 minute car radius which is a drawback for me but apart from that I would love to come and stay again! Lovely house in a beautiful setting - everything you could wish for. The chalet was truly lovely, in a peaceful part of the Morvan Park. I would certainly recommend this for a tranquil break. There are no street lights, so at night you can look at the stars in all their glory, whilst listening to the wildlife around the lake. The food and wine of this region are of a very high standard, and the people extremely helpful and friendly. Great places to visit but so nice to appreciate your surroundings whilst staying here, and the chalet was very well equipped, clean and modern so there is no need to go far if you don't want to. Les propriétaires sont charmants, le chalet est très confortable et correspond exactement au descriptif. Magnifique séjour à renouveler... Merci Mr et Mme Laurent. Le chalet est tres chaleureux et tres bien équipé dans un cadre très reposant. Malgré un temps mitigé notre semaine a été tres ressourcante. De tres bons moments en famille. Week-end et Mid-Week seulement en basse saison et sur demande : Week-end arrivée vendredi 16h départ dimanche 18h (prix 440 €) Mid-Week arrivée lundi 12h départ vendredi 10h 4 nuits (prix 440 €) Semaine arrivée Samedi 16h départ Samedi avant 10h. Tarif Ménage en option à 70€ Une caution de 600€ sans encaissement sera demandé et restitué aux locataires.